Eetti starring Atharvaa and Sri Divya got declared a success for being a commercial entertainer. Directed by Ravi Arasu, the film spoke about a rare disease also highlighting the awareness needed for it. If a filmmaker starts with a win, he/she is bound to get bigger projects. 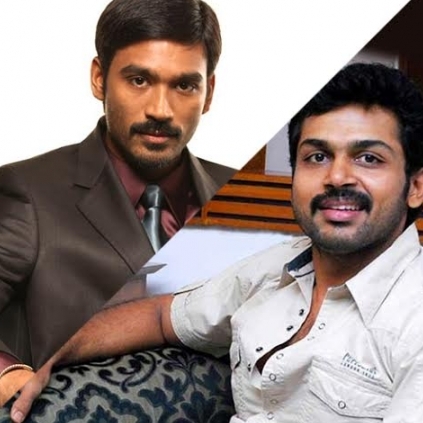 Sources confirm that Ravi has narrated a story to both Karthi and Dhanush. Though it is too early to tell whether the project will materialize or not, the director is certainly going in the right direction. We would update you! Narendra Modi Will Be Meeting Rajinikanth Today At His Residence In Poes Garden. Diamond Babu's Son, Doctor Vikram Sagar, B.D.S Is Getting Married To Preeti, B.D.S This February. People looking for online information on Dhanush, Eeti, Karthi, Ravi Arasu will find this news story useful.